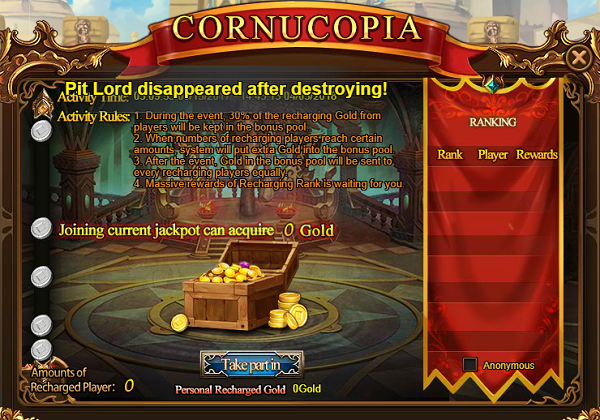 Cornucopia! Joining Current Jackpot to Get Gold Bonus! 1. During the event, 30% of your recharge will be put into the pool. 2. When number of players who recharged during the event reaches certain amounts, system will put extra bonus Gold into the pool. 3. After the event, Gold in the pool will be shared equally to those players who recharged during the event. 4. Players who recharged during the event will be ranked. After the event, top 10 players will receive extra ranking rewards. Previous>Brand New Event: Honored Chest! Christmas Goddess-Shera Is Coming Back! Next>Big Giveaway of Retinue Cards! Come and Join!